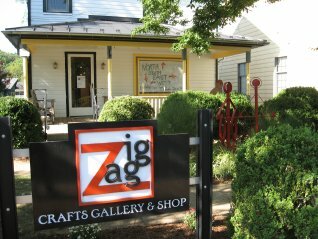 Zigzag Crafts Gallery and Shop was opened in December 2004, by owner/artist Susan Jeffries, as a gallery that shows crafts/art by local artisans. Presently we carry hand-made crafts from the U.S. and worldwide, covering an interesting selection of hand-made crafts including wood, jewelry, ceramics, glass, metal, and paper arts. Zigzag Gallery also presents group and solo exhibitions of local, regional, and international contemporary artists. A wide variety of media is featured, with special emphasis on Works on Paper. Please check our exhibition schedule on this site. Another aspect of our shop is our Children’s Corner, which offers many games and craft kits that encourage creativity in children. We also offer after-school programs for young people, weekend family workshops, and Camp Zigzag, a summer arts camp. Future plans include classes for adults in book arts and printmaking. Although we do not currently sell over the Internet, we welcome inquiries concerning the work of the gallery artists and are happy to send pictures and prices via e-mail or regular mail upon request. We ship items anywhere within the U.S.
Zigzag Crafts Gallery and Shop is located in the quaint village of The Plains, Virginia (just off Rt. 66, one hour west of Washington DC) and a short distance from Marshall, Warrenton, and Middleburg. VA.